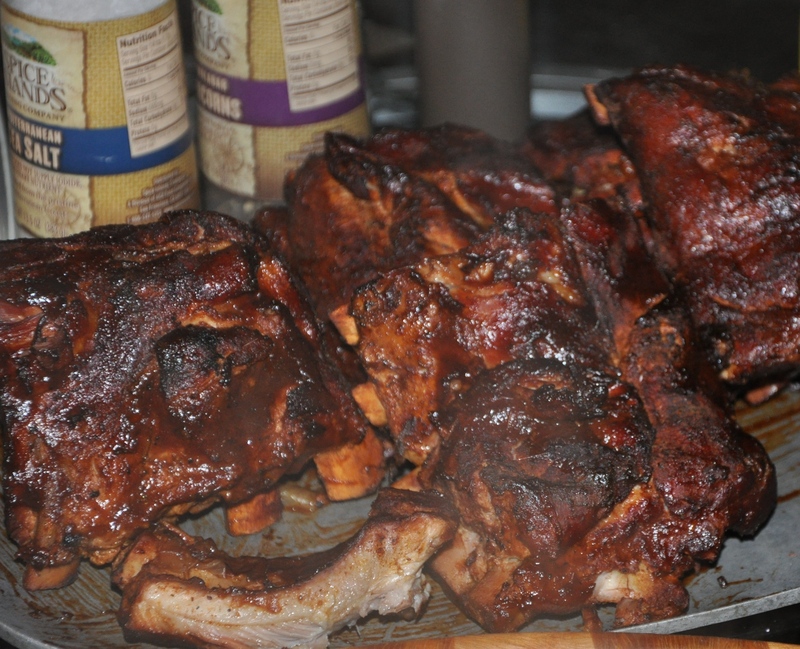 Turn Your Grill into a Smoker and ROCK these Ribs!!! Happy Father’s Day! Today is the perfect day to do some outdoor “smoking”. 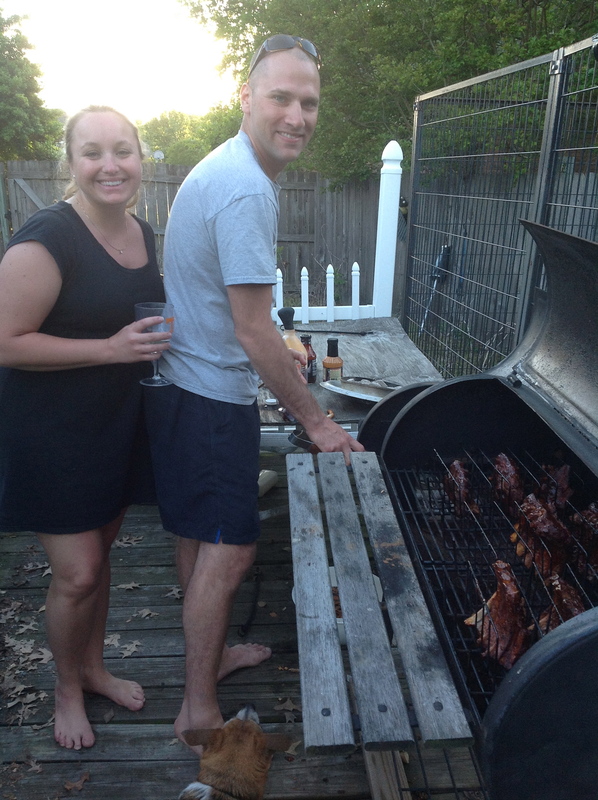 I have owned a propane grill for years, just love it. But I have always wanted a charcoal grill to get the real charcoal flavor for some types of food. A few weeks ago, I finally made that leap to a charcoal grill! Last night I attempted my first ever (yes its true) smoked ribs. I also prefer to leave the rub on as long as possible, preferably overnight. 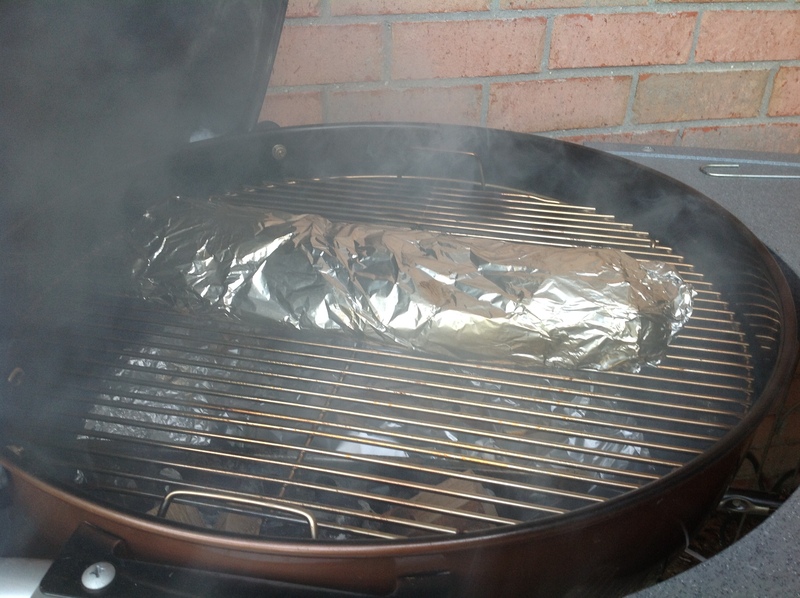 One more thing, I wrap my ribs in foil or the first couple of hours of cooking, this is known as “Crunching”. America’s Test Kitchen is a real 2,500 square foot test kitchen located just outside of Boston that is home to more than three dozen full¬time cooks and product testers. Our mission is simple: to develop the absolute best recipes for all of your favorite foods. To do this, we test each recipe 30, 40, sometimes as many as 70 times, until we arrive at the combination of ingredients, technique, temperature, cooking time, and equipment that yields the best, most foolproof recipe. America’s Test Kitchen’s online cooking school is based on nearly 20 years of test kitchen work in our own facility, on the recipes created for Cook’s Illustrated magazine, and on our two public television cooking shows. 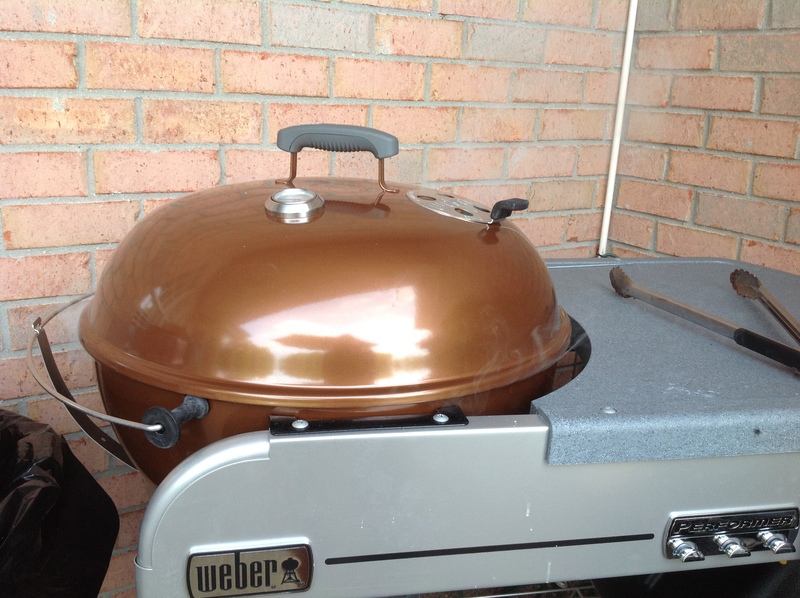 It’s a TACO Grilling Party, with my BEST grilling friend, Weber® Just Add Juice® Marinade Mixes. Click on link below for recipes. A watermelon contains about 6% sugar and 91% water by weight. As with many other fruits, it is a source of vitamin C.
The amino-acid citrulline was first extracted from watermelon and analyzed. Watermelons contain a significant amount of citrulline and after consumption of several kilograms, an elevated concentration is measured in the blood plasma; this could be mistaken for citrullinaemia or other urea cycle disorders. Watermelon rinds, usually a light green or white color, are also edible and contain many hidden nutrients[vague], but most people avoid eating them due to their unappealing flavor. They are sometimes used as a vegetable. In China, they are stir-fried, stewed or more often pickled. When stir-fried, the skin and fruit is removed, and the rind is cooked with olive oil, garlic, chili peppers, scallions, sugar and rum. Pickled watermelon rind is also commonly consumed in the Southern US. Watermelon juice can be made into wine. Watermelon is mildly diuretic and contains large amounts of carotenoids. Watermelon with red flesh is a significant source of lycopene. Preliminary research indicates the consumption of watermelon may have antihypertensive effects. 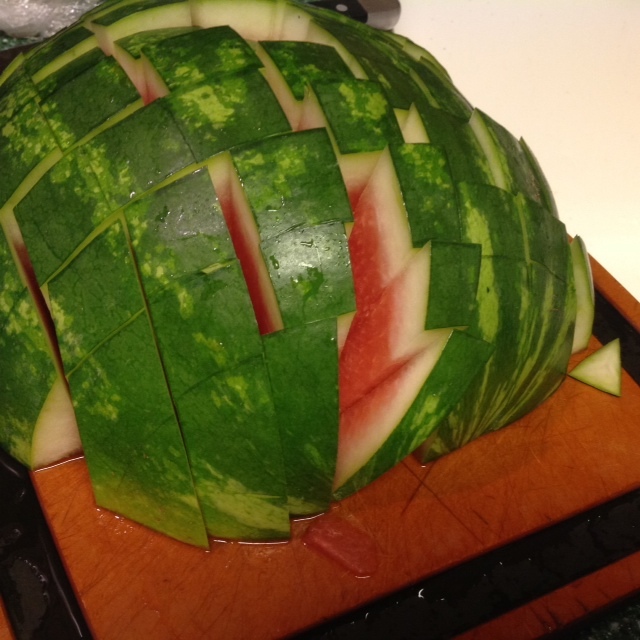 Now, what’s the BEST way to cut up a watermelon you might ask? Well, this has been on Facebook and I thought it was brilliant..so here you go. Start out with a cutting board and a sharp knife. 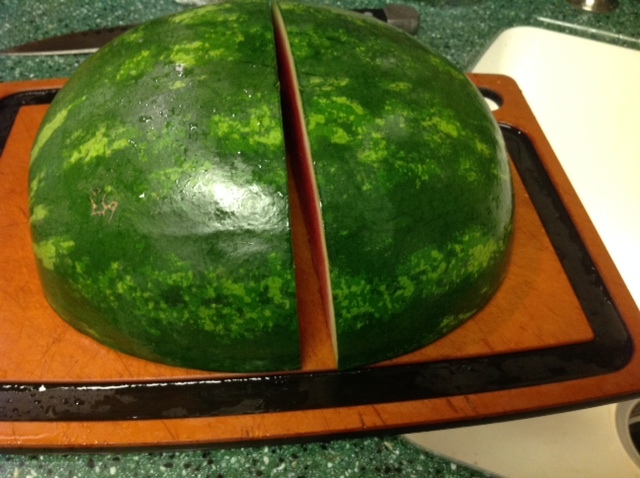 Cut your watermelon in half lengthwise, then cut widthwise. Next, make one-inch slices widthwise and then lengthwise, see below…. 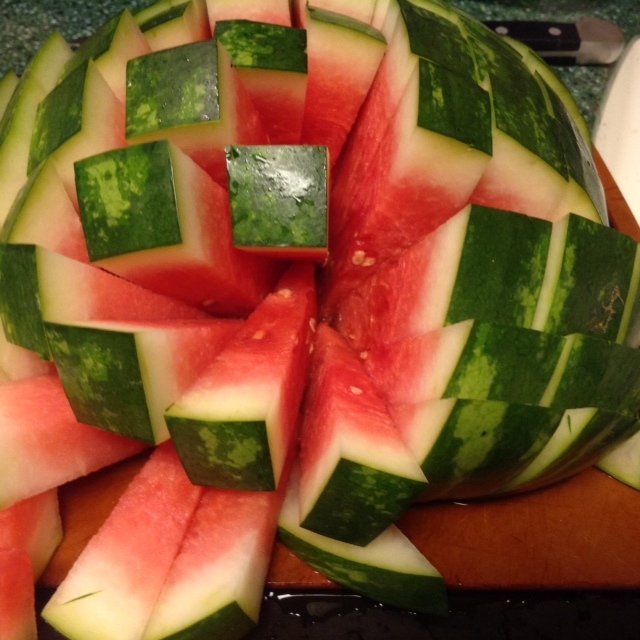 You now have a watermelon that is so easy to eat, a great snack for anyone to grab and go.